Garmtech Review 2019: Is Garmtech a Good Hosting? Baltic web hosting provider GARMTECH provides a very polished and modern platform for any type of hosting. With them, you can pay a little more for fantastic hosting with infrastructure that will help make your hosting solution a success. Web hosting provider GARMTECH has been a big player in the Baltic hosting market for more than 15 years. It has served more than 5,000 customers, and it provides hosting products that make it easy for anyone to set up a website or other hosting solution. Service is provided in English, Latvian, and Russian. GARMTECH provides SSD hosting with all of their products, which gives up to 300% faster read/write times than conventional disk drives. And considering it’s SSD, the storage limits are quite high at 10GB SSD for standard web hosting and 50GB SSD for WordPress hosting. WordPress hosting comes with WordPress pre-installed as well as the WordPress toolkit (via the Plesk Onyx control panel) that ensures your WordPress is secure and up-to-date. You can also have a beginner-friendly website builder installed on a standard web hosting package. CloudLinux OS and CloudFlare servers ensure great page load times, and you can choose between Linux or Windows (with Windows supporting MS SQL). Other provided features include DNS management, Patchman, website statistics, anti-spam and virus protection, and email hosting with auto-responders. Although their VPS plans look good in terms of features, they come with slightly limited resources of 3000MHz CPUs, 4GB RAM and 110GB of (SSD) storage, but at least they provide 1Gbps ports, and the company is busy upgrading its servers to use Fusion-io. You also get a choice between the Plesk Onyx, cPanel, and ISP Manager control panels. Since they don’t provide the cheapest hosting, it’s more a matter of deciding if their packages provide good value for money. Web hosting comes with high SSD storage limits and unlimited bandwidth. Six months or longer billing terms include a free domain (not including ID protection) and discounted billing starts at yearly terms. You’ll also need to purchase an SSL certificate separately. Other value-added services include email, virus protection, a Plesk Onyx control panel, and DNS management. Windows options are more expensive, and you’ll need to add-on MS SQL separately. All-in-all, the pricing seems decent for a polished and modern hosting solution with high resources. While no control panel or domains are included in the price of their VPS hosting options, these are cheaper than much of the competition. All of their VPS and web hosting packages (but not dedicated servers) are covered by a 15-day money-back guarantee. GARMTECH provides free 24/7/365 technical customer support in Latvian, Russian, and English with all of their hosting products. You can reach out to them via telephone, ticket, live chat, or email. They even provide great pre-sales support with agents willing to help you choose the right hosting solution for you, and they also provide a very handy knowledge base with a variety of topics and video tutorials. The only reason not to consider GARMTECH is if you are looking for some of the cheapest hosting on the market. If you’re willing to pay a bit more for quality, then GARMTECH is a fantastic value-for-money proposition in the Baltic region. Get polished and modern web, WordPress, and VPS hosting at GARMTECH. 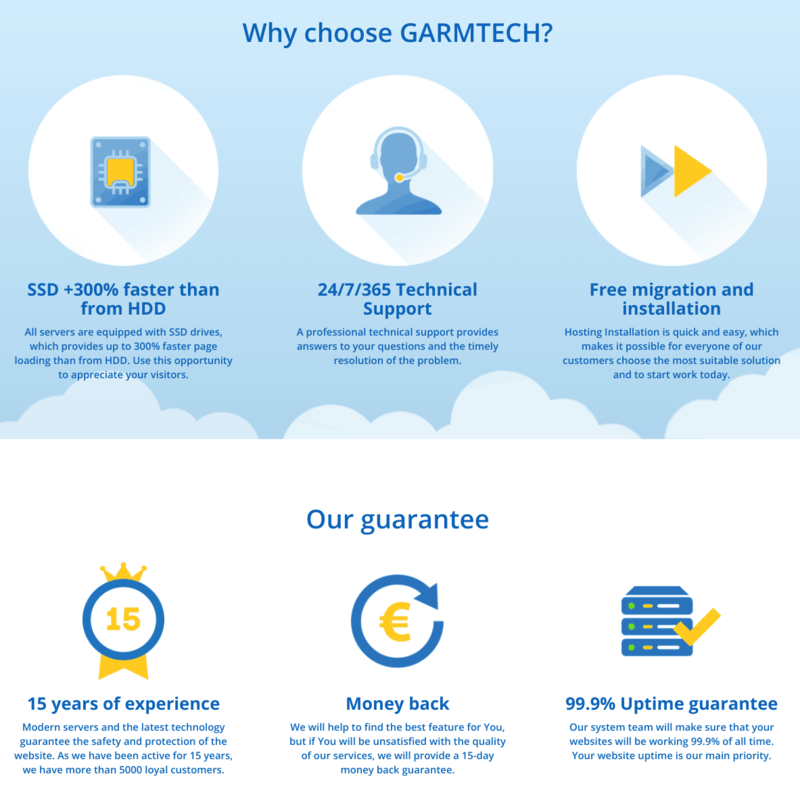 Wondering how Garmtech stacks up against other Web Hosting companies? Enter any other Web Hosting company and we will give you a side-by-side comparison.